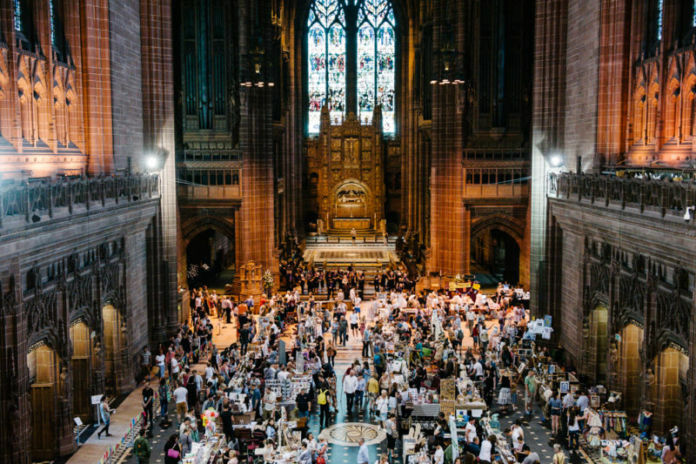 Kick off your summer with the biggest and best arts and crafts fair in the region as the Open Culture Summer Arts Market returns to Liverpool Cathedral! As always visitors to this year’s market can expect stalls from over 200 of the best of the region’s artists, designers and makers; creating a huge bustling market inside one of the city’s most stunning buildings. Illustration, woodwork, handcrafted beauty products, photography, ceramics, clothing and hand-poured candles can all be found in the aisles, plus homewares, paintings and jewellery. Anything – and everything – you can imagine, all handmade and utterly unique. Cathy Gilliat of The Little Shop of Glass produces quirky, functional and decorative pieces of fused and copper foiled glass. Cathy started learning glass after undergoing cancer treatment, as it was a medium she had always been interested in. Her unique background in writing lyrics for songs has contributed to her work, as her creativity is mirrored through the wonderful medium of glass. Chris Duncan works with sheet metal to create pop-culture inspired artwork that is sold to private collectors, and via galleries worldwide. Particularly, Chris’s unique ComicCan work is becoming more and more popular with its unusual combination of art created straight onto drink cans that have been collected from the streets. Lucy Pickavance is a self-taught portrait artist, using pencil, pastel and crayon to capture realistic and expressive likenesses of wild animals and well-know people in popular culture primarily from photographs. She creates powerful and moving expressions in her human faces, reflecting her training in anatomy and keen appreciation of natural form. Matthew Storrow produces various works through a graphic style inspired by 2D and 3D architectural techniques from his background as an architect. The result manifests in a series of forms ranging from enamel pins and laser cut wooden ornaments, to unique screen prints and etchings. Martyn Holder of Geekcycled creates affordable and imaginative gift ideas for the geeky at heart. Many of the items are produced using recycled or pre-loved original comics, textbooks and music to produce homewares, jewellery and paper products. All the images are hand selected for their visual impact, to create a beautiful and visually appealing item. The Food Fair, downstairs in the Dining Room, is back for another year, with tasty food and drink on offer including handcrafted chocolate, pies, blended teas, jams and chutneys, fruit liqueurs and – of course – cake. Vintage is also back, with a treasure trove of retro goodies along the corridor in the Concert Room, with a whole mix of decades and eras to choose from and everything from jewellery, men’s and women’s clothing, books, homewares and vinyl to be found – be sure to leave enough time for a good look around! The Cathedral’s Welsford Café will be open all day serving a BBQ and other refreshments. After tirelessly exploring their favourite equation Art + Science = Fun, the Craft Lab professors have a new children’s activity to share. Families are invited to join them to make free Pop-up Pets and find out what happens when you combine craft with kinetic energy. Bounce along and spring into summer! The Summer Arts Market is organised by Liverpool social enterprise Open Culture, who have staged the event annually since 2013. The market aims to provide the public with a chance to purchase affordable, unique work directly from artists and makers; helping to support independent businesses in the creative economy and keeping money local. Open Culture also produce festive sister event the Winter Arts Market, which takes place at the Cathedral on Sat 1 December 2018.